I love cooking at this time of the year. Vegetables and fruits are bountiful and at peak tastiness. It’s not too hot to use the stove top. And a week’s vacation at the end of August left me feeling (relatively) stress free at home and work. Not wanting to add any unnecessary work to my day, the dishes below provided a quick, tasty, and healthy meal and they take full advantage of the overabundant squash and beans from your or your neighbor’s backyard garden. This menu is light. If you want something more substantial for dinner or if you are cooking for guests, pick up a rotisserie chicken at the supermarket, cook up a little pasta to serve with the squash saute, or splurge on a trip to Kopp’s or your favorite ice cream store after dinner. What better way to celebrate the last few, long, warm nights of summer. Cut the squash in half lengthwise (or if the squash is very thick, cut it into quarters lengthwise), then dice into 1/2‐inch‐thick pieces. In a large saute pan with a lid, heat the olive oil over a medium‐high heat until hot but not smoking. Add the squash and saute, stirring occasionally, for about 5 minutes, until it just begins to brown. 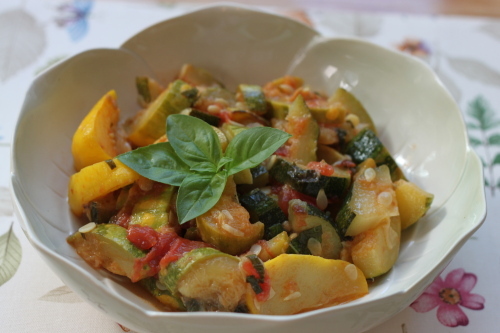 Sprinkle the salt, pepper and garlic powder over the squash, then stir in the tomatoes. Cover and cook, stirring every few minutes, for 10 to 15 minutes longer, until the squash and tomato just begin to break down. Remove the lid and continue to cook until your desired sauciness level. Stir in the basil and serve with grated Parmesan cheese, if desired. This dish tastes great over cooked pasta or rice or as a side dish. Bring four quarts of water to a boil in a large pot and add 1 tablespoon salt. Add the beans and blanch them until crisp‐tender, about 3 minutes. Drain the beans in a colander and cool under cold running water; drain well. Combine the green beans, chickpeas and kidney beans in a large bowl. Add the mint and toss. Add half the vinaigrette and toss gently again. Season with salt and pepper. Serve or, if possible, let stand at room temperature for 1 to 2 hours to bring out the flavors. Serve the salad with the remaining vinaigrette on the side. Whisk the vinegar, water and olive oil together in a small bowl, or shake the ingredients together in a small, lidded jar, until well incorporated. The vinaigrette can be refrigerated for up to 5 days.